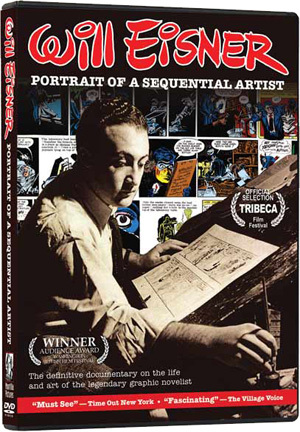 Will Eisner: Portrait of a Sequential Artist (DVD). Buy at Amazon. Blu-ray Edition. Buy at Amazon. "WILL EISNER: PORTRAIT OF A SEQUENTIAL ARTIST"
Will Eisner: Portrait of a Sequential Artist © 2007 Sequential Artist, LLC. The distinctive Will Eisner signature is a trademark of Will Eisner Studios, Inc. The Spirit is a registered trademark ® of Will Eisner Studios, Inc.